Peter the Great named his new city after his patron saint and he gave it a Dutch pronunciation: Sankt Peterburg. (His admiration for Amsterdam was considerable.) 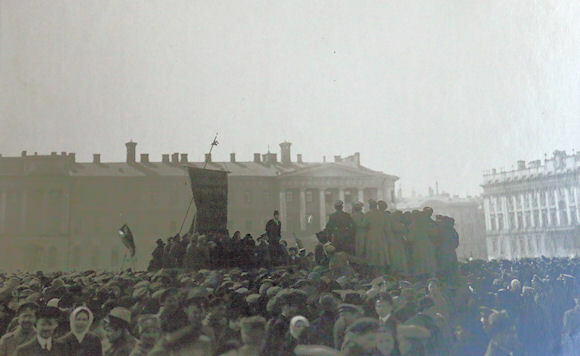 Gradually the name evolved into St. Petersburg, as another aspect of the city's commitment to Europeanization, but by September 1914 that seemed too German-sounding, and on the outbreak of the First World War a gust of chauvinism caused the tsar to rename it Petrograd. Thus, during the hot days of the Bolshevik Revolution, it was the Petrograd Soviet who gradually painted Russia's capital red. Lenin, who didn't trust the cosmopolitan city and who felt it was too vulnerable to foreign attack, moved the capital to Moscow in 1918. When he died, in 1924, the Communist Party renamed Petrograd as Leningrad and thus baptized it after someone who despised it. On 6 September 1991 it was named back to Sankt-Peterburg, of which the English-language equivalent St. Petersburg is commonly used.